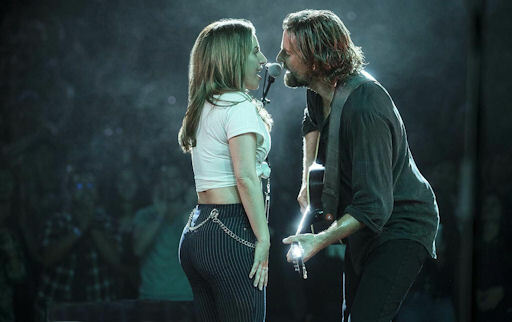 Review: A Star is Born / It's Just Movies Review: "A Star is Born"
At the 10th Annual Academy Awards in 1937, “A Star is Born” – with seven nominations, one win and a special award – started something that would stick around in Hollywood for quite some time. Eight decades later, we are taking one more look at this story, through Bradley Cooper’s eyes. Cooper wrote, directed, produced and stars in the third remake of “A Star is Born.” Although the 1937 film was not a musical, the core story has remained throughout out its iterations. The newest version had a very successful opening weekend, pulling in $42.6 million so far, exceeding the anticipated $30 million. There was immense buzz leading up opening weekend which helped drive those numbers, and with talks of Oscar contention, “A Star is Born” came out of the gates strong and audiences seem to be responding well. With two leads by the name of Bradley Cooper and Lady Gaga, there’s a lot for this movie to live up to. Lady Gaga has described the set while shooting the film as a sanctuary for making art. The film is about two artists who fall in love, which more often than not translates to intensity. Artists are passionate and when two artists come together, the emotions are extreme and that is not just in respect to intimate relationships with artists, that’s any relationship. Art cannot exist without emotion or beauty, and isn’t beauty to be interpreted? That’s path Ally (Lady Gaga) and Jackson (Cooper) travel in “A Star is Born,” a path of art, emotion and, in my opinion, beauty. Some might even say tragic beauty. While Ally’s career is catapulted, Jackson’s slows down for a multitude of reasons, and what adds to the abundance of emotion and struggle is that all of this is going on amidst the journey of falling and being love for these characters. Yes, the film is about a singer/songwriter who has given up on ever “making it.” Yes, the film is about the already accomplished musician who “discovers” said singer/songwriter. Yes, the film is about love, what we do for love and how we interpret that love through art. What is captivating about “A Star is Born” is that it is about all of those things, but it is also about so much more. This film deals with the issues of family, substance abuse, friendship, codependency and insecurities on a very raw and human level. The performances in this piece are natural and honest. I mean to say, there is no acting, there is only people speaking truth in every frame. Not a frame was wasted in telling this story either. Cooper and Gaga have a chemistry that you just buy. Sam Elliott plays Cooper’s brother and the two of them have a chemistry that you also buy. Anthony Ramos plays Gaga’s best friend and the two of them have a chemistry that you buy as well. Everyone works so well with, and because of, each other and this makes the story relatable, believable and you really become invested in these characters. The cast also includes Andre Dice Clay, Dave Chappelle and Lukas Nelson and the band Promise of the Real. The promise of real is captured defiantly and delivered emphatically in the musical performances, which were filmed live. Not a word was lip synced. Cooper not only had a hand in writing the screenplay, he also wrote and co-wrote many of the songs in the film. Lady Gaga is an established, Grammy-winning singer/songwriter/musician. Music is known to be her craft. Conversely, it is not what Cooper is known for. He studied the guitar and piano in addition to working with a vocal coach in preparation to play Jackson. Not only did he have a coach for singing, he also had a dialect coach to aid him in producing the speaking voice he wanted to come out of Jackson’s mouth. On the flip side, Cooper’s craft is known to be acting, and although Gaga won a Golden Globe for her work on “American Horror Story,” she had some pressure to work alongside the Oscar-nominated actor, as this was her first leading role in a feature film. Lady Gaga shows off her chops whilst succumbing to the vulnerability and insecurities that many many artists have … no, no, many many humans have. As well as Cooper sings, Gaga performs. They complement each other in every way, vocally and in connection. Sound design and music are obviously very important in a film where a lot of singing happens. The mixing on this film is very impressive, especially considering all the songs were sung live. The plot of the film is a predictable but it is delivered with such heart, you almost forget you know what’s going to happen. There are plenty of homages to the first three versions of this film and yet this story is current and incorporates the modern view of fame. The pace of the film is admittedly quick. Not a frame is wasted and the story is consistently being moved forward. To me, it was almost like a time-lapse of the scape of fame, media and the obstacles involved with those things in modern society. I appreciated the quick pace because it did not take away from my investment in the characters. The cast is remarkable and the ensemble of drag queens were comic relief. I absolutely recommend “A Star is Born.” There are some flaws, definitely predictable, and there are a few things I would have liked to have seen. However, those few indiscretions do not at all take away from the experience that was presented on screen. Being a sound heavy film, I do recommend seeing it on the big screen. Cooper has said that he made the film for the large screen and specifically has plugged Atmos, Dolby’s surround sound technology, in several interviews, insisting that audiences not watch “A Star is Born,” rather experience it. Honestly, as impressed as I was with the entire project, it really is Bradley Cooper’s doing. He is enthralling to watch, what he brings to Jackson in heartbreaking yet supremely honest and I really empathized with him. What Cooper has done here is extraordinary. The man is a machine. I concur with the Oscar buzz surrounding Cooper, if for no other reason than he had so many jobs which means several categories to be nominated in, and he really should be honored for the art he has birthed to us.